The Dyuktai culture was distinguished over a large area of northeast Asia including Yakutia, Chukotka, Kolyma, and Kamchatka. Because the territory is vast and there are certain differences in the tool assemblages, it has been suggested that Dyuktai should be considered a tradition containing several related cultures, called Dyuktai in Yakutia and Ushki in Kamchatka. In Kolyma and Chukotka, there were complexes that had most probably developed under the influence of both cultures. These were also impacted by the Far Eastern (Ustinovka culture) and Amur (Selemja culture) Paleolithic cultures. The Dyuktai culture was defined by Yuri Mochanov in 1967, following the Dyuktai Cave discovery on the Aldan River, Yakutia. In the Pleistocene deposits, at a 2-m depth, lithic tools and Pleistocene animal bones were exposed, radiocarbon dated to 14,000-12,000 BP. Further research in Yakutia resulted in the discovery of other Dyuktai culture sites on the Aldan, Olenyok, and Indigirka rivers. The sites are located along the banks and at the estuary capes of smaller tributaries. The Dyuktai culture tool assemblage is represented by choppers, wedge-shaped cores, microblades, end scrapers on blades, oval bifaces, points, as well as angle, dihedral, and transversal burins on flakes and blades. The emergence of the Dyuktai culture defines the time when the microblade technique first appeared in northeast Asia. Judging by bones found in the same layers with tools, the Dyuktai people used to hunt mammoth, wooly rhino, bison, horse, reindeer, moose, and snow ram. Fishing tools have not been excavated, although a few fish bones were found in the Dyuktai cave Pleistocene cultural levels. The cultural materials at the sites were concentrated around small hearths with no special lining. The question of whether the bow and arrow existed in the Dyuktai culture has so far been open, because just a few stone points small enough to be used on arrows were found. Yu. Mochanov associates the Dyuktai culture emergence in Yakutia with the bifacial Paleolithic cultures coming from the southern Urals, Kazakhstan, Mongolia, and northern China. From Dyuktai materials of some stratified sites, Yu. Mochanov dated the Dyuktai culture to 35,000-11,500 BP. This date was broadly discussed by scholars within the debates on the question of the microblade industry emergence in Siberia and aroused some serious objections. The dates exceeding 25,000 BP are deemed to be erroneous, so the microblade technique appeared in Siberia no earlier than 25,000 BP. A. Derevyanko supposes that the origin of the Dyuktai culture can be found on the Selemja River, tributary of the Amur, in the Selemja culture, by 25000-11000 BP. The Dyuktai tradition was spread over all of northeast Asia. In Kamchatka, it has been represented by the materials of the Late Ushki Upper Paleolithic culture in levels V and VI of the Ushki I-V sites. It determines the latest period in the Dyuktai tradition development, 10,800-8800 BP. Its general outlook differs significantly from that of the Dyuktai culture in Yakutia. The sites are located on the bank of a small lake in the valley of Kamchatka's largest river in its medium flow. The exposed dwellings are represented by surface, teepee-type, 8-16 m2, and semi-subterranean with the corridor, 10-44 m2, with circular stone hearths in the center. Several inhabited horizons exposed on the site and numerous stone tools, burials, and caches found in the dwellings testify to its long-term use, perhaps even as a winter camp. Judging by tooth remains in the cultural level, its people hunted for reindeer, bison, and moose. Burned salmon and other fish bones found in the hearths as well as the sites location at the spawning lake confirm the existence of fishing. 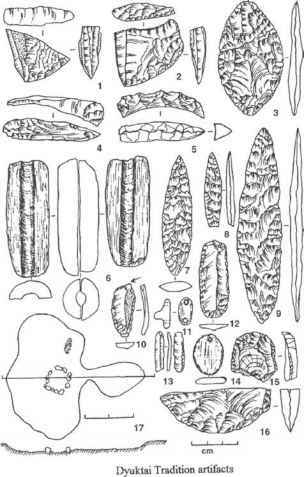 The tool assemblage of the Ushki culture consisted of small- and medium-sized bifacial projectile points; end scrapers; angle, transversal, and dihedral burins; semilunar and oval bifaces; end scrapers on blades and flakes; microblades and wedge-shaped cores; and grooved pumice shaft straighteners. Ornaments were represented by oval pendants. 10—transverse burin; 11,14—pendants; 12,15—end scrapers; 13—retouched microblade; 16—wedge-shaped microblade core preform; 17—plan and section of a dwelling with a dog burial from Ushki Site (level VI). 1-5, 7-16—stone, 6—pumice. straighteners, wedge-shaped cores, retouched microb-lades, pendants, and so on. The ground permanent teeth with fine holes for hanging are associated with a certain ritual. In one of the dwellings, a dog burial containing burial inventory and ochre spots was found. In Kolyma, the Dyuktai culture is represented by materials from the lower level of the Kheta site. The typical wedge-shaped cores, ski spolls, bifaces, transversal burins, leaf-shaped arrow points, oval bifaces, end scrapers on blades, and pendants make up the traditional tool assemblage of the Late Paleolithic complexes in Siberia, the Far East, and Yakutia. On the Indigirka River, the Dyuktai tradition materials are considered to be exposed at the Berelekh site. However, this is questionable because these few materials were found in a complicated stratigraphic situation. Next to the site, there is a mammoth cemetery. The engraved mammoth tusk fragment with an 18.5 x 5.7 cm picture of a mammoth with enormously long legs and trunk was found 60 km away from the site. However, its location and stratigraphic position are obscure, but the patina on its surface and in the engraving is of the same origin, which testifies to the same time of its formation. The mammoth's legs are interpreted by some scholars as the later portrayal of the mammoth melting out of the permafrost. At the same time, its erect tail suggests that the picture was engraved to present a live animal in a state of aggression. In Chukotka, several sites with Dyuktai tradition materials were found, including Ulkhum, Kurupka I, Lake Tytyl', and Lake Elgygytgyn sites. These were mostly represented by surface materials with small tool assemblages. As none of the sites are radiocarbon-dated, wedge-shaped cores with microblades have been considered to be the basic Dyuktai tradition indicator. Materials from the Druchak-Vetrenny site, located on the Okhotsk-Kolyma Range and containing the classical transversal burins, are interpreted as a result of the influence of the strong Far East's culture on the Dyuktai tradition of northeast Asia. 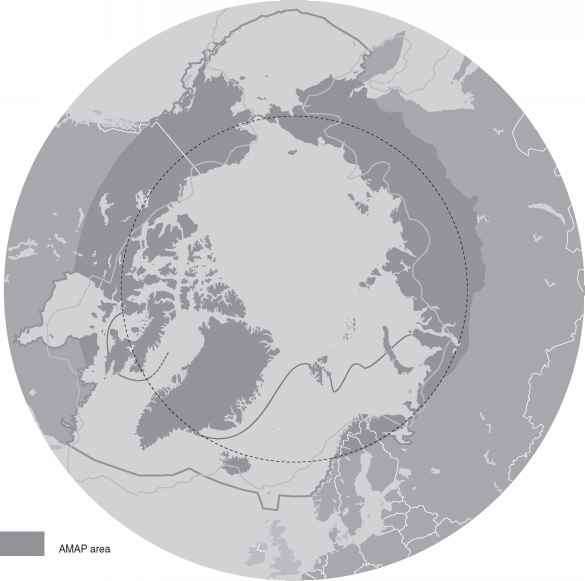 The Dyuktai tradition is thought to have spread to Alaska via the Bering Strait in the Late Pleistocene; there it became the basis of the American Paleo-Arctic tradition, Denali complex (see American Paleo-Arctic Tradition). It is also supposed to have served as the base for the Paleo-Indian culture (ancestors to the modern Native American tribes), but there is little evidence of this because the Paleo-Indian culture never had such a well-developed microblade technique. In Yakutia, the Dyuktai tradition disappeared c. 10,500 BP, when it was completely replaced by the Sumnagin culture. This change was marked with the Early Holocene disappearance of bifaces and the switch from wedge-shaped microcores to conic and prismatic ones. Both in Chukotka and Kamchatka, the Dyuktai tradition existed as long as the Early Holocene. What artifact type does the denali sites of the american arctic and dyuktai have in common?